Users experiencing this problem will need to find alternative ways to get around this until MS corrects this problem. Users are recommended to use Windows 7/8 or Linux PC OS platforms as an alternative method to use and connect with D-Links DNS storage units when this problem appears. Ensure the box is CHECKED for SMB 1.0/CIFS File Sharing Support. This older drive needs this box CHECKED. This is a Microsoft issue. Please contact MS for further information about this. 1. The bug referenced in the second register article above (where I was quoted) was around how customers who used SMB1 would fail to connect. SMB1 is a very old and unsafe protocol from 25 years ago (it was at the heart of the Wannacry and NotPetya ransomware attacks, for instance). We deprecated it 6 years ago, there's more info on that here: https://aka.ms/stopusingsmb1. SMB1 was replaced by SMB2 and SMB3 10 years ago and those newer protocols are present in all supported versions of Windows, Mac OS, and the Linux kernel. The last Windows OS to require SMB1 was XP. 2. According to https://support.dlink.com/FAQView.aspx?f=gWJF0HOEoYThPqaf8T4XYg%3d%3d, the D-Link DNS series of NAS devices provides an SMB1 server and requires SMB1. It cannot use SMB2 or later. Starting in Windows 10, we started to remove SMB1 from general usage in a phased approach, depending on your edition. For Windows 10 Home or Professional users, basically we would check to see if anyone was using SMB1. If it didn't appear so after 15 total days of OS uptime, we'd uninstall it. There are many more details here: http://aka.ms/smb1rs3. What this boils down to is, if you or Windows uninstalls SMB1 (or you are using an OS that does not even contain SMB1 anymore, like Mac OS X), you will not be able to connect to these D-Link DSN NAS devices. 3. If you want to reinstall SMB1 in order to access your D-Link DNS NAS - which again, we do not recommend - you only need to enable the SMB1 client. You do not need to install all the other aspects of SMB1. To do this, open Programs and Features, then open Turn Windows features on or off, then under "SMB 1.0/CIFS File Sharing Support, just enable SMB1.0/CIFS Client. You don't need to enable the other features in order to connect to your D-Link DNS NAS. Ned, thank you very much for the clarification and information regarding this. This is very help for users with D-Link NAS. I'll be sure to have D-Link review this as well. "For Windows 10 Home or Professional users, basically we would check to see if anyone was using SMB1. If it didn't appear so after 15 total days of OS uptime, we'd uninstall it." Does this mean you fully remove it or just Disable SMB1? As you said "If you want to reinstall SMB1 in order to access your D-Link DNS NAS - which again, we do not recommend - you only need to enable the SMB1 client. You do not need to install all the other aspects of SMB1. To do this, open Programs and Features, then open Turn Windows features on or off, then under "SMB 1.0/CIFS File Sharing Support, just enable SMB1.0/CIFS Client." Just want to be clear on this that SMB features are there in Windows 10 and just disabled from an MS perspective. Is MS doing same thing for Windows 7 and 8? I presume that the next Windows OS release will not have any SMB1 at all? Thank you for coming to the forum and letting us know. "Does this mean you fully remove it or just Disable SMB1?" We're not touching Windows 7 (its support is almost over) nor Windows 8 (it's basically a rounding error compared to Win10 ). We haven't gone all in yet - while Enterprise and Server don't have any by default at all, Home and Pro are tougher to decide because they don't have managed environments or IT users. So we shall see. Ok, thank you for this information. Helps clear some things up. Hope this will be helpful for D-Link customers and users. Not sure what D-Link will do with SMB. So we shall see. D-Link is not going to update the firmware for the DNS series devices to update SMB unfortunately since they have been long discontinued and SMB 2 (and higher) require licen$ing. Use NFS instead. 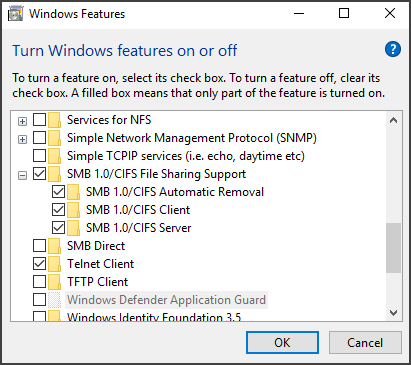 Enable it on Windows 10 (turn windows features on/off > Services for NFS) and on the NAS. Most D-Link NAS units support it.